Koubou Corporation Japan has launched a new note book Lesance EC703GW with 17” wide screen TFT color liquid crystal display. The resolution is WXGA+ (1440 X 900 pixels). 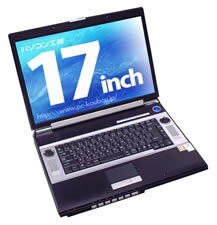 The main specification are :- Intel (R) PentiumM-750 (1.86 GHz) /FSB533mHz/L2cache 2MB CPU, memory DDR2 533 -512MB ( 256MB×2, maximum 2GB),HDD60GB 4200rpm,8x DVD±RW. Super high ended VGA NVIDIA Geforce Go 6800 PCI-EXPRESS x16 is used for on-board graphics to enjoy TV and DVD along with latest games. Interface USB 2.0×4, IEEE 1394×1, Express Card 54/34 slot ×1, Gigabit Ethernet, SD card /MMC/ memory stick slot, mini- D-Sub15 pin, S video output and voice input/output etc.The note book comes loaded with the Windows Media Center– enjoy audio,video,TV etc easily with the included remote control. The Koubou Lesance EC703GW measures 397×285×44mm (width x depth x height), and weighs 4.5kg.